After missing last week's practices and twice visiting the hospital with a bout of food poisoning, Clark forced a fumble and recorded his first career interception in the Seahawks' 33-31 loss to the Los Angeles Rams. It would be easy to blame the turkey burgers. It was some foul fowl, after all, that twice sent Seahawks defensive end Frank Clark to the hospital last week, that forced him out of three straight days of practices, that required eight IVs just to counter the seemingly endless stream of vomit emanating from the fourth-year defensive end. It was an undercooked turkey burger (or two) that cost Clark 12 pounds and robbed him of his stamina. “I had food poisoning, man,” Clark said, sitting hunched at his locker after the Seahawks’ 33-31 loss to the undefeated Rams on Sunday. “He was just sick as a dog,” Seahawks coach Pete Carroll said. Still, Clark showed up to CenturyLink Field on Sunday in Seattle’s 33-31 defeat to the L.A. Rams. You could blame it all on the burgers. But that’s not what the 6-foot-3 defensive end was willing to do. “My wind, it wasn’t where I needed it to be or where I wanted it to be. But at the end of the day, none of that matters to me, man,” Clark said. “I looked at my boys. I look at the people I lost in my past. Losing my father … I lost my father in a fire, you know what I’m saying? At the end of the day nothing that I go through is going to be harder than that. On Sunday, Clark was there — especially early. 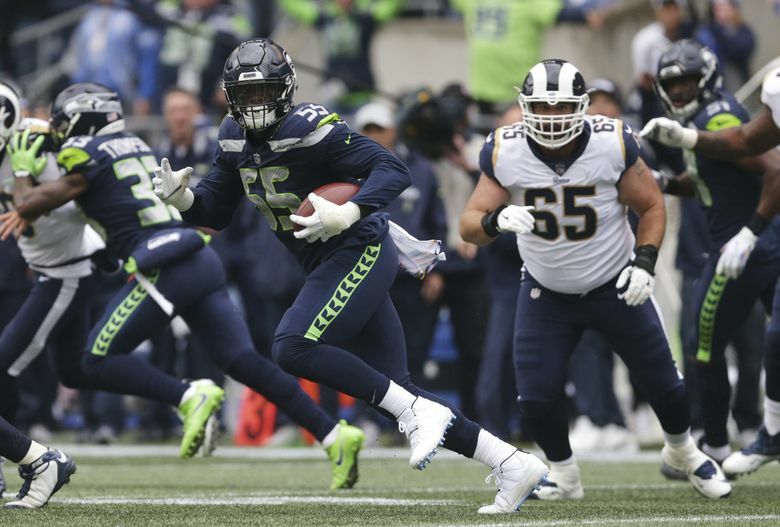 The 25-year-old defensive end essentially ended the Rams’ first offensive drive when he blew past the left tackle and stripped Los Angeles quarterback Jared Goff. A few minutes later, cornerback Tre Flowers deflected a pass in the end zone, and after linebacker Bobby Wagner bobbled it, Clark snagged it with both hands and started back the other way. He ducked under a tackle attempt and weaved to his left through traffic for a 26-yard gain. Clark finished with two tackles, a forced fumble, a pass defended, a tackle for loss and his first career interception. “It was a really hard week for him, but he made it through and was able to contribute. That was a great effort by him,” Carroll said. Still, it wasn’t enough — not against an offense that finished with 468 total yards, against a quarterback that completed 72 percent of his passes, against a running back in Todd Gurley II who added 113 total yards and three TDs. The defensive line’s three tackles for loss, one sack and one quarterback hit weren’t enough, and Clark knows it. “Games like this, where we allow it to get away from us, it’s on guys like the D-line,” Clark said. “When you look down the board and you look at the stats and you see the pressures and you see the quarterback hits and the sacks, they aren’t where they’re supposed to be. I take it personal. Of course, Clark — who has 10 tackles, three sacks, one forced fumble and one interception through five games this season — will also have to get back in the kitchen. It’s true, he was snake-bit by his beloved turkey burgers. But that will never be an excuse. “I’m not 100 percent right now with anything I’m going through,” Clark said. “You go through stuff all season. That’s why I say none of it matters at the end of the day, because you’ve got to be able to come out here and compete. If you feel for your teammates, if you’ve got any type of heart or any type of (manhood), you’ll go out there and compete, no matter what the cause is, no matter what’s going on. Because you’ve got people at home who are relying on you. Better believe, next time Clark is craving a turkey burger, he’ll stick with his favorite brand.